Here are some of the most common features of Storypark. Click the menu button and then select 'Latest activity' to see what’s been happening in your Storypark community. All the latest stories, posts and comments will show first. 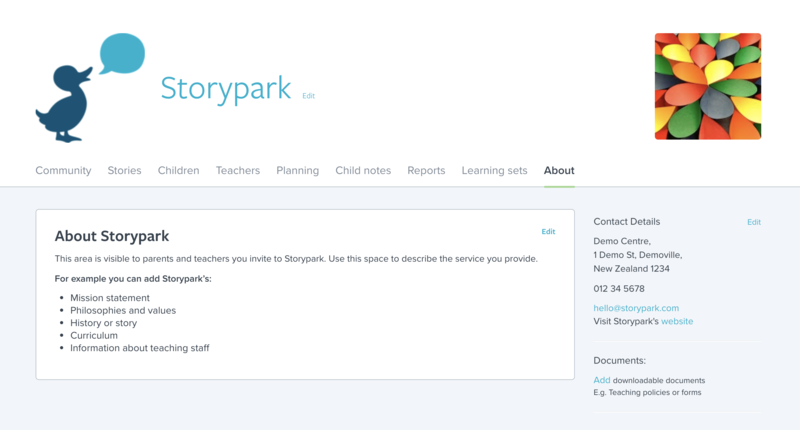 This is where you can invite parents and other teachers to be part of your Storypark community. 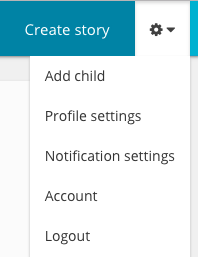 ‘Add new story’ will take you to the story editor where you can write a story about one or more children. 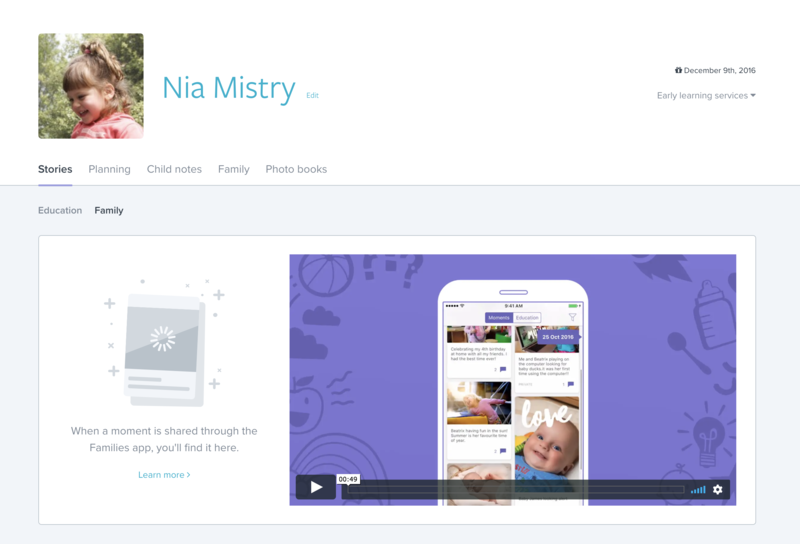 ‘Add child’ will take you to a page where you can add a child to your Storypark community. 'Profile settings' will take you to a page where you can update your personal details and password, add a profile image. If you're a teacher you can edit your privacy settings. From this page you can also export your portfolio stories for viewing offline. 'Notification settings' will take you to a page where you can control what emails you receive by updating your email notification settings. ‘Account’ shows you the details of the plan your early learning service is on. ‘Logout’ logs you out of that computer. Here you can create a story, add and edit text, images, videos and PDFs, select the children in the story, add learning tags, save as a draft, or publish. ‘Draft stories’ is where you can view all the stories you’ve started but haven’t published. View a snapshot of all your early learning service’s stories. Order them by ‘Recent activity’ (stories with new comments appear first) or by ‘Story date’ (date published). 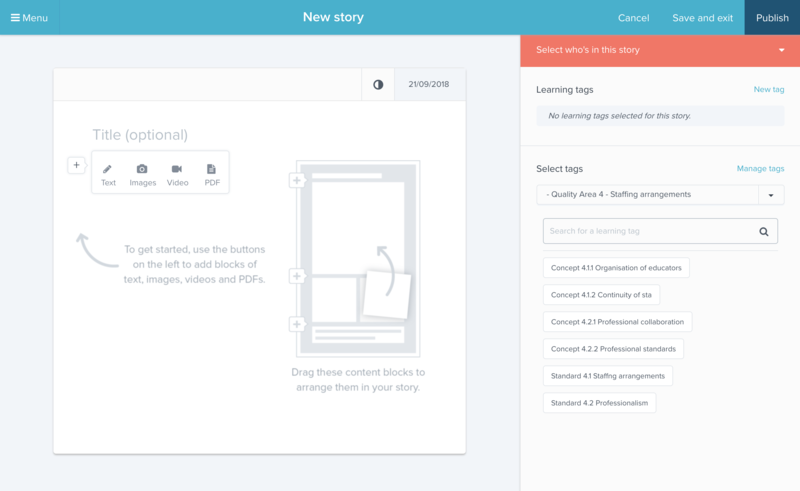 You can also filter your stories by the learning tags in them. 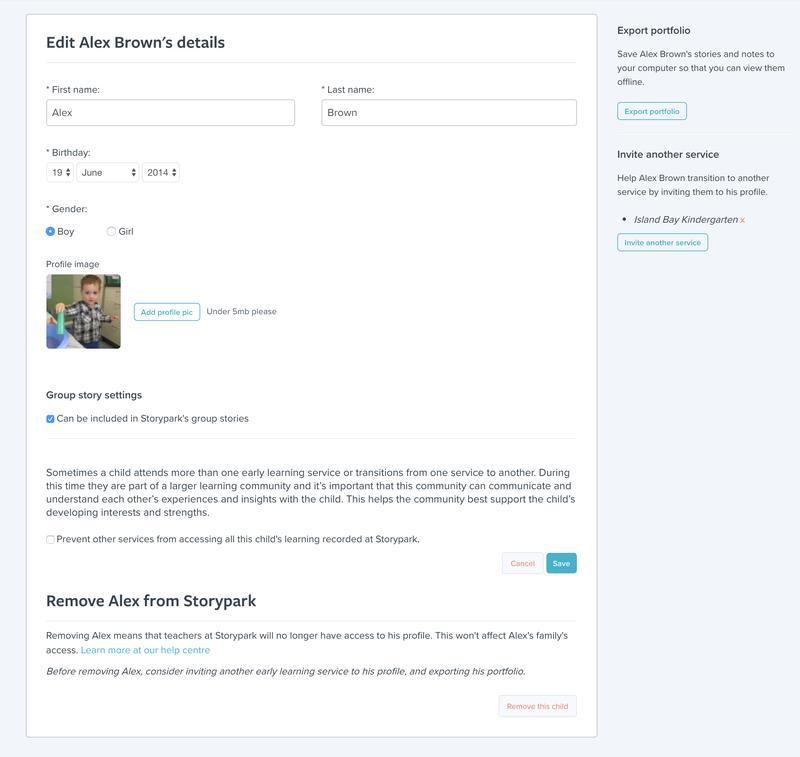 Post and view updates that everyone in your Storypark community can see and contribute to. 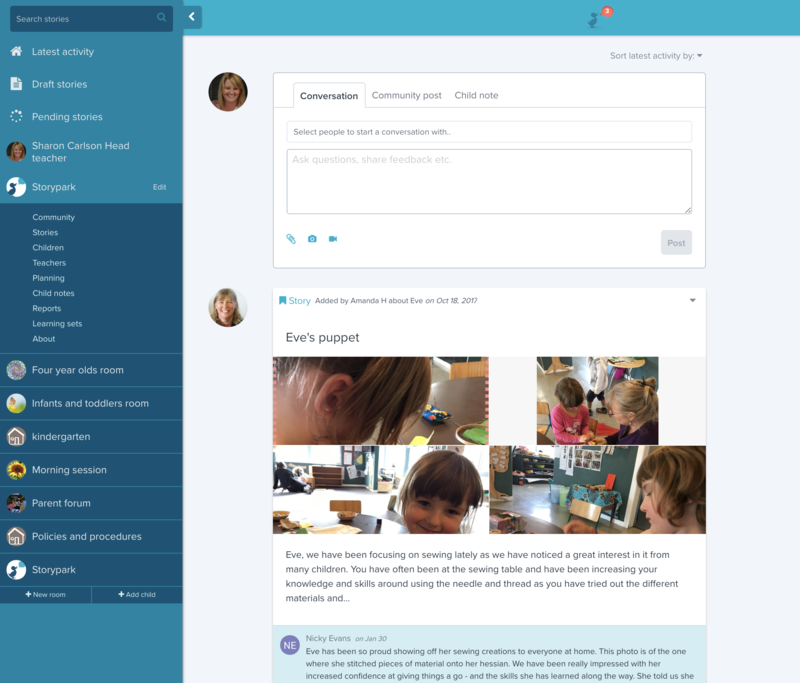 View and manage all children in your Storypark community. Click on each child to go to that child’s page and stories. The drop-down arrow next to each child’s name lets you quickly edit their details, or add a note or story about them. 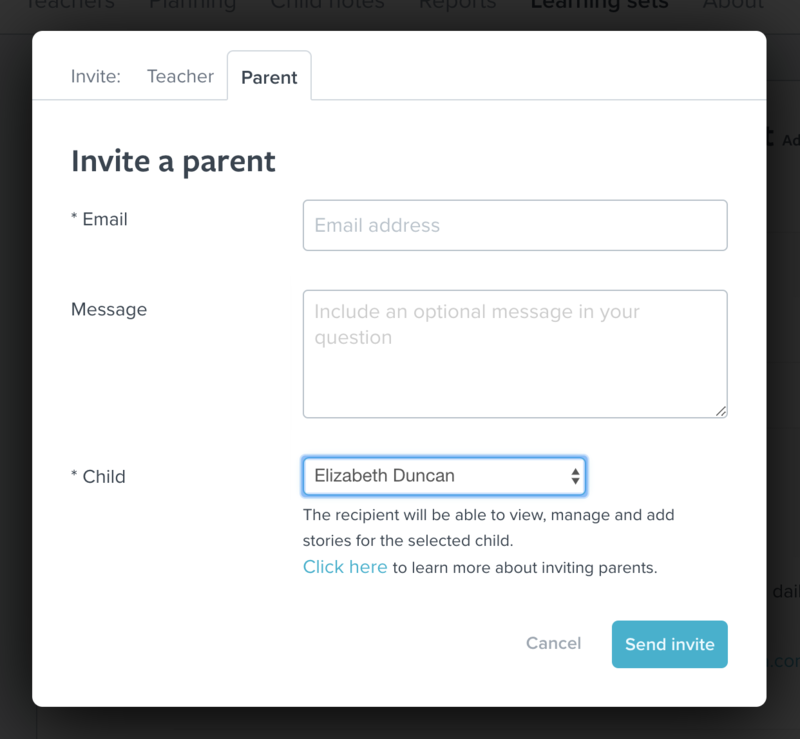 Sort the children by age, name, latest story or pending invites. 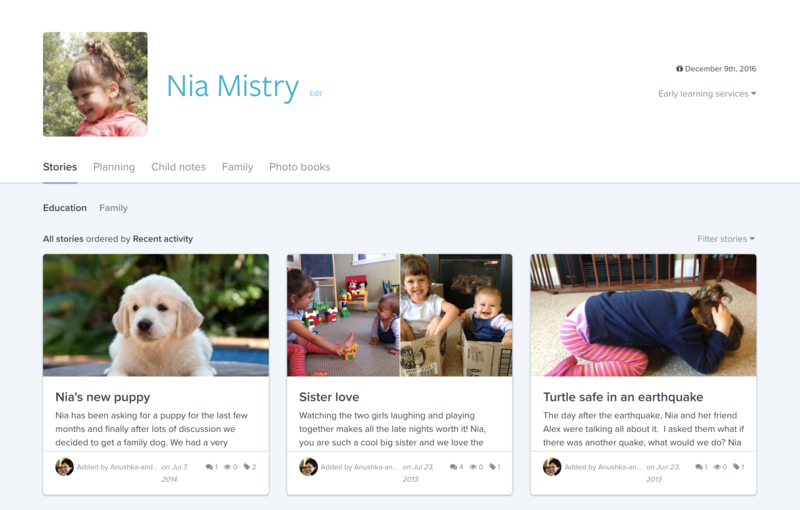 View a snapshot of all a child’s stories, invited family members, and notes. View the story order by ‘Recent activity’ (stories with new comments appear first) or by ‘Story date’ (date published). 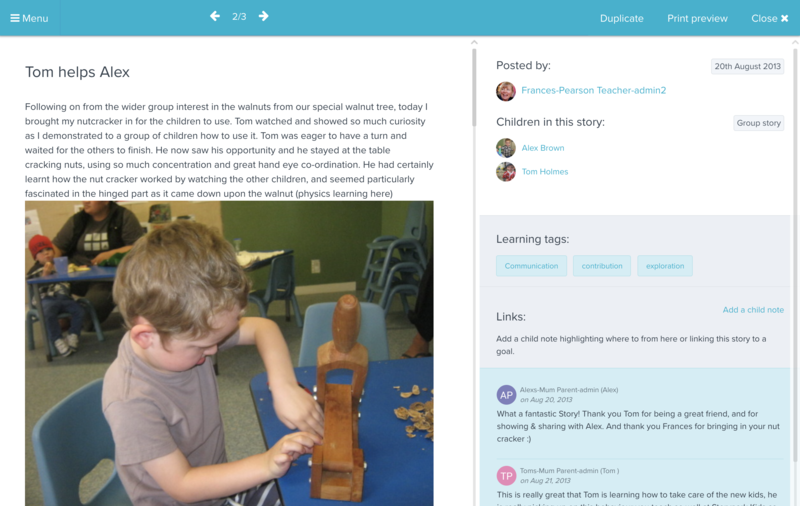 You can also filter their stories by the learning tags in them. When you click on any of the stories on a child’s, teacher’s or early learning service’s profile page the full story will open in a box within this page. Scroll down to read the full story and any comments that have been made. From this view you can see which children are in the story, the author, date added, and learning tags. Authors and admins can edit the story, and print it with various print options. Navigate to the next story using the arrows at the top, or close the window to go back to the snapshot view. When a teacher adds a child they can invite one of that child’s family members (usually a parent). That person can then choose whether or not to invite more family members. Once invited, they’ll be shown here. 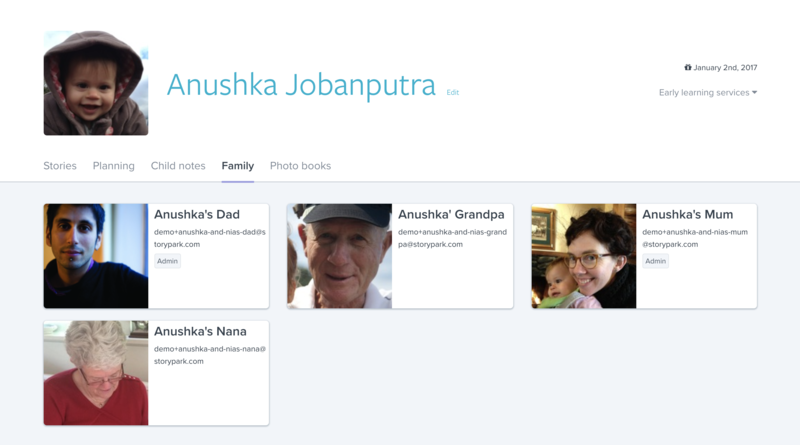 You’ll be able to view each person’s name, profile image, and email address. If a person is an admin (an admin can manage a child’s account), this will be shown next to their name. This is where a child’s teachers and family members who are admins can privately read and discuss information together. 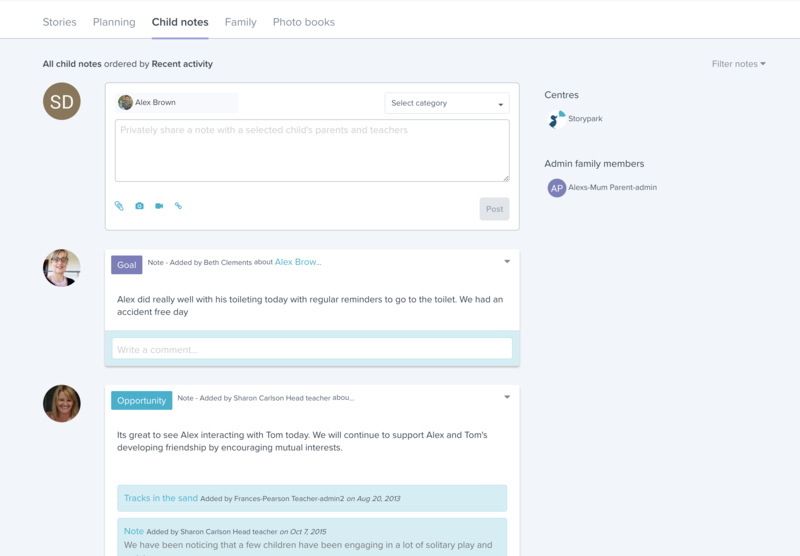 When a child's family creates a moment on the Storypark for Families app and they select the option to share it with their child's teachers, the moment will appear on a child's 'Stories' page under the 'Family' tab. Edit a child’s name, birthday, gender and profile image. Teachers can select whether a child can appear in a group story or not. From this page you can also remove the child from your Storypark community. Before removing a child, you may want to invite another early learning service/school, or export their stories. 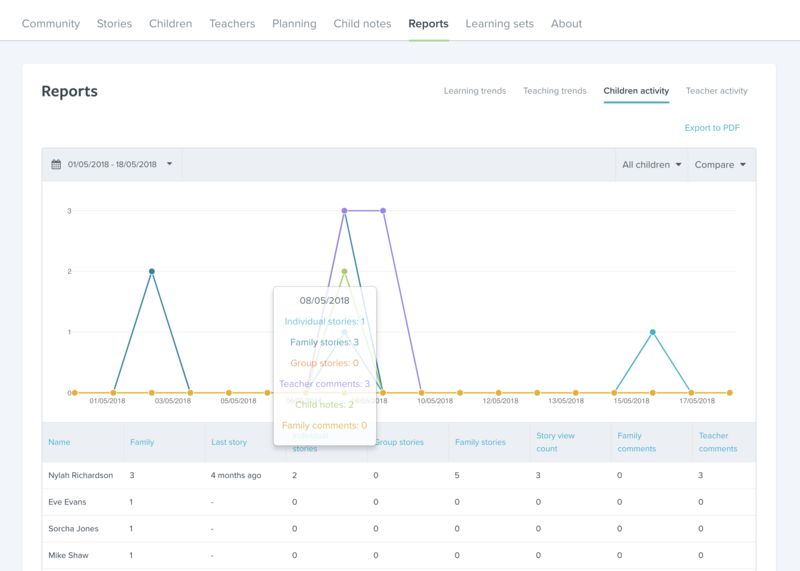 Compare the activity and trends happening at your early learning service. Get information on numbers and dates of stories, comments, notes, views, posts and logins. View by child, teacher, family member and room. Manage your learning sets and tags. Learning sets let you organise and make links to (‘tag’) your learning outcomes or curriculum (eg. Te Whāriki, Early Years, International Baccalaureate etc). You can use or adapt an existing ‘public’ set or create your own private learning set. Learning sets are simply a collection of learning tags, organised within folders. Adding tags to your stories lets you later group and filter stories by tags. Use this space to describe the service you provide. You might include your mission, philosophies, values, history, curriculum and information about teaching staff. Show your contact details, and upload useful files for your teachers and family members to download. 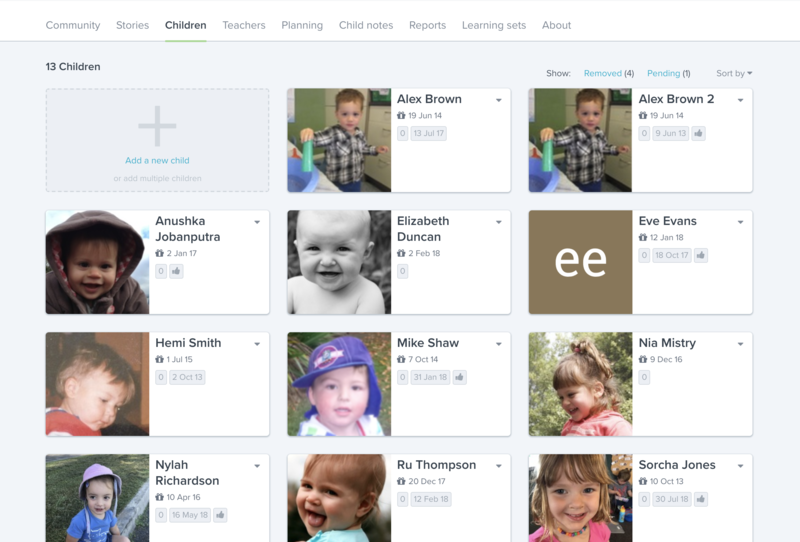 Rooms allows teachers to group children, families and teachers. A room works in a similar way to your wider early learning service's area with it’s own children, teachers, community discussion, stories and notifications. 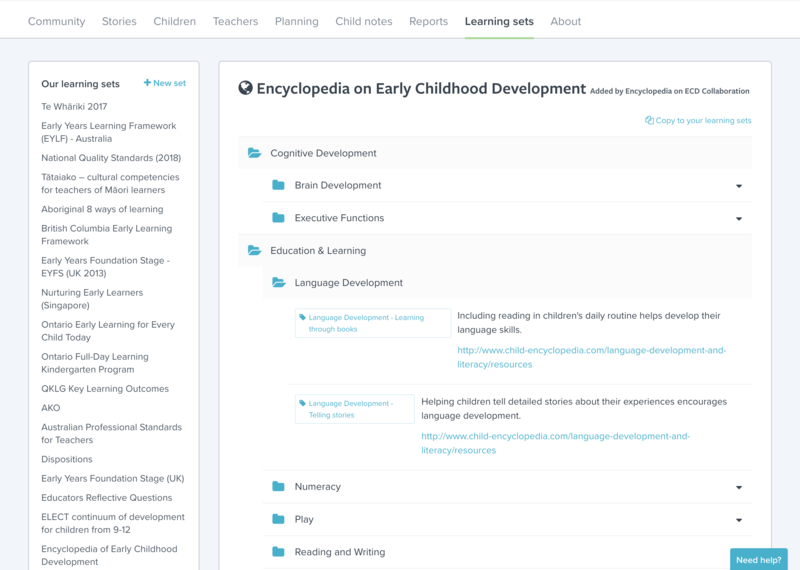 You can set up as many rooms as you like within your early learning service, and access them in the menu under your early learning service’s name. 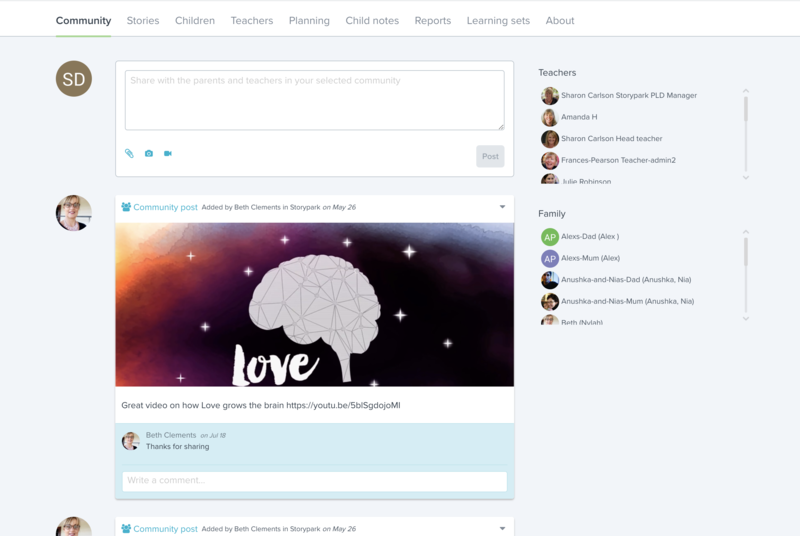 Each teacher has their own page showing a snapshot of all the stories they’ve written, an area for personal conversations, and their teacher portfolio. 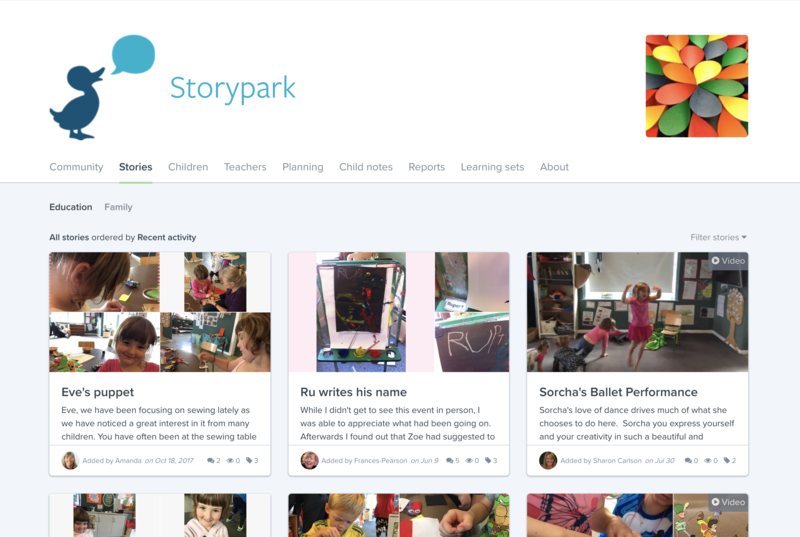 This page is visible only to other teachers in their Storypark community, not family members. To access a teacher’s profile click on the teacher’s name from your early learning service’s ‘teachers’ page. Or, visit your own teacher profile by clicking on the links under your name in the menu. The ‘Conversations’ tab on a teacher’s profile page is where teachers can have conversations with other teachers (eg. a head teacher) who can offer their feedback by leaving comments or starting a new conversation. Portfolio stories allow teachers to document evidence of their work over time. Create or adapt a learning set (ie. ‘Registered Teacher Criteria’, ‘Graduate Standards’, ‘Self-review’ or other assessment criteria that may be relevant to you as a teacher), then link your portfolio stories to your chosen criteria using the learning tags in these sets. Over time you can analyse and review your progress against your personal criteria. This makes support, reporting and assessment processes faster and easier. Notifications are alerts you receive when somebody does something within Storypark that demands your attention. Notifications show up as a little number in a red speech bubble next to the Storypark duck at the top of the page, and in some cases, as an email. Clicking the duck icon will take you to your notifications page. You can change what emails you receive (or unsubscribe from all emails) on your 'Notification settings' page.